Pam shares some tips for saving money on Once a Month Cooking. She has experience in the freezer cooking trenches, feeding a family of 6 on her husband’s tight teacher salary and developing recipes for OAMM’s Traditional menu. How does OAMM help you save money on once a month cooking? First, each menu writer considers the seasonal produce. For example, we know from a budget-friendly standpoint it’s not practical to include strawberries on the November menu as they are out of season and expensive. However, sweet potatoes and apples will likely be on sale at the local grocer, farmer’s market, or in your CSA boxes that time of year. Next, we look at popular sale cycles. With each season, grocery stores also have sales on everyday products. For example, during the summer we can find BBQ sauce, salad dressing, and grilling meats at the best price, while in the fall baking items and canned soups are on sale. Once each menu writer has reviewed the best seasonal and sale cycle ingredients, we look for recipes that include these products and write them into our menus. New menus are released the first day of each month, and to achieve the maximum savings, we suggest you ideally shop throughout the month, and then cook the menu towards the end of the month (although you can still save money by buying all at once). Breaking the shopping into smaller trips is the ideal because it allows you to wait for the lowest sale price during the month. It also helps you to budget weekly for your cooking day. Spreading the cost out over the month is often easier than spending the whole amount at once, especially if you manage your grocery budget week to week. For example, if you were to make a New Year’s resolution to start once a month cooking in January, you would take our January menu, review the grocery list, shop all month for your ingredients and plan your big cooking day for the end of the month. Then you would store those meals in the freezer and eat them throughout the month of February while you’re collecting ingredients for February’s menu. Unless you’re using the vegetarian menu, meat can take a big chunk from the monthly budget. I’m sure there are many different ways to go about saving money on meat (feel free to share your ideas in the comments!) but here are my best meat saving tips. Meat goes in sale cycles just like other grocery items. 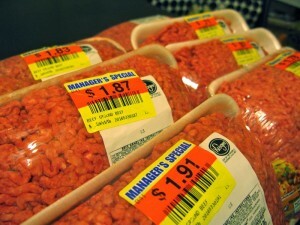 Where I live, some weeks boneless skinless chicken breast is on sale for $1.99/lb, but other weeks it’s over $3 a pound. The trick to maximizing your savings on meat is to “stock-up” when it’s the best price, buying several pounds (or as much as the menu recommends) at a time so you don’t have to pay full price later on. My other favorite secret about buying meat is looking for markdowns, often called “manager’s specials.” It’s well worth it to talk to the butcher and ask what day and time of day they mark down, and then get there at that time! Often times I can find really great cuts of meat for amazing prices just because they are nearing the sell-by date and need to be cooked or frozen. In either case, unless you are going to be cooking it right away, freeze your meat until your big cooking day. Note: The USDA recommendations indicate that you CAN freeze most meats, defrost them and refreeze them without cooking them IF they have been SLOWLY thawed in a refrigerator and never spent time in the Danger Zone of above 40 degrees. I’ve been a “couponer” for about three years, and there is no doubt in my mind that coupons can save a lot of money. I typically save 50-80% on my grocery bill each week, thanks to savvy shopping and coupons. 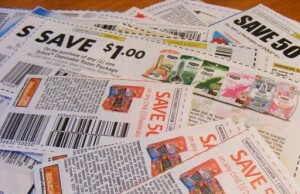 Most of the time, coupons follow similar grocery store sale cycles. Since we at OAMM strive to base our menus around these sale cycles, there’s a good chance you’ll find coupons that will match up with the monthly menu items. Buying in bulk can often be a good way to save money. Since you are bulk cooking with OAMC, it makes sense to make bulk purchases. Take advantage of memberships at wholesale stores such as Costco and Sam’s Club when you freezer cook. Just check the unit price against your local sales to see if buying the bigger version really is the better price. Now it’s your turn. What are some ways you save on groceries? Please leave your tips in the comment section, and feel free to ask money-saving questions as well. The next time we talk about cooking costs, I’ll be sharing some actual dollar amounts from other once a month cookers, and tips on budgeting for your big cooking day. Stay tuned!